The apocalypse did not happen folks. Colorado launched the first taxed and regulated retail sales of recreational pot Wednesday, and while demand was high, the vibe was mellow. By 11:40 a.m. Wednesday, Denver city officials in charge of the rollout were crowing. In stark contrast to the average Black Friday sale, the thousands of people who lined up to buy sacks were orderly, peaceful, and respectful of the law. Lines formed at dawn at 3D Cannabis Center in Denver Wednesday. Snowfall accompanied the 8 a.m. sales launch. "It's a blessing," said one customer. Both the mayor of Denver and the city's police chief commended the behavior of customers and store owners, as well as the city staff, which licensed eighteen stores in Denver by the January 1, 2014 deadline. “I kept telling the staff, ‘We have to dot every ‘i’ and cross every ’t’! This will not be like the ObamaCare rollout,” said one staff member. "Thankfully it wasn't." About two dozen stores are now open across the state, with the vast majority of them in Denver. 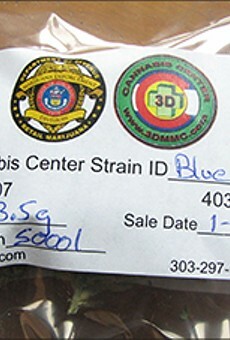 Eighth-ounces went for $48 at 3-D Cannabis Center on Brighton Boulevard. That was with the 21.22 percent tax. Supplies of weed held up as well and store owners we talked to seemed confident about their inventory in the coming weeks. The most rowdy, pushy contingent of Green Wednesday was the press. The official press conference at 3-D Cannabis at 7:30 a.m. Wednesday was a full-on media circus with shoving and hollering to capture the first legal pot sale in modern American history. I'm not going to say how I know, but let it suffice to say I'm pleased to know some of CO's journos are enjoying legal #marijuana, too. For more color, check out some breaking stuff I did here, and some pictures of the day. More in the Legalization Nation column on Wednesday. The plight of the neighborhood pot dealer just got a lot harder in Colorado. In Denver, many think they'll go extinct.